Film Intuition: Review Database: TV on DVD: Agatha Christie’s Poirot: The Movie Collection -- Set 4 -- Mrs. McGinty's Dead ('08); Cat Among the Pigeons ('08); Masterpiece Mystery! TV on DVD: Agatha Christie’s Poirot: The Movie Collection -- Set 4 -- Mrs. McGinty's Dead ('08); Cat Among the Pigeons ('08); Masterpiece Mystery! Devotees of the novels of Agatha Christie-- the most prolific author in history whose extraordinary body of work ranks only third behind the Bible and Shakespeare for the most widely read pieces of literature around the globe-- may find it easy to mistake Ms. Christie with the fictitious Ariadne Oliver. Like Christie--Oliver, you may recall was a mystery writing heroine who was more than a little fed up with her fictitious masculine character as well as a woman who was very good friends with Christie's most famous invention of Hercule Poirot--who similarly was a bit of a thorn in Christie's side. Eagerly describing himself to anyone who asks as the most famous detective in all the world-- Poirot's Belgian sleuth who sees England through the beneficial eyes of a foreigner is so superbly played by David Suchet to the point that one cannot even pick up a novel today without envisioning that penguin like walk, feeling the tickle of that bizarre mustache, the intensity of the strange gaze and hear the richness of the Royal Shakespeare Company trained actor's voice. 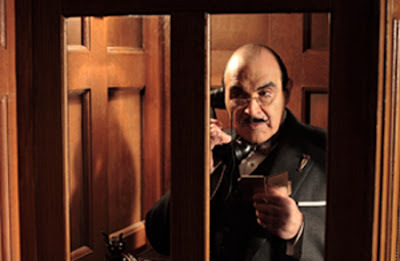 Suchet's Poirot is more than just a character but a masterful tour de force in pulling a man off a page and turning him into a flawed human being who can solve a crime but can't manage to solve the problem of a normal relationship with his overly focused ways. So instead of a significant other-- he has plenty of friends-- and to this end, characters crop up throughout including the memorable Ariadne Oliver (portrayed by Zoe Wanamaker) as an author growing weary of the main character she's created in her own series of novels. Obviously some took this invention as a commentary on Christie's own attitudes towards Poirot whom she was so eager to kill off that she'd written his final case several decades before it was ultimately published and the fictitious man's obituary made its way onto the front page of The New York Times. However as Suchet and others interviewed in the fascinating roughly fifty minute documentary Super Sleuths contained within this box set note-- Christie was far too clever to do something as prosaic as that and instead used Oliver satirically, the way that as Suchet intriguingly points out, her decision to make Poirot foreign gave her the freedom to poke fun of her homeland. While the creation of Poirot was most likely inspired by the arrival of Belgian immigrants who arrived in her area when she worked in a nearby pharmacy including (as the legend goes) one man who had a singularly identifiable mustache-- whatever the case may be-- the woman who used her knowledge of poisons and pharmacology from working as a hospital dispenser managed to create her own unique brand of detective novel that she seldom strayed from, both to the delight and the dismay of her readers and critics alike. Therefore, she was part of the burgeoning renaissance (of predominantly female!) British authors who were crafting what would become known as the "village mystery" whereas on this side of the pond-- with the lean muscular stylings of men like Dashiell Hammett and Raymond Chandler-- we moved towards the dark, pulp and noir based shadowy streets instead of deceptively cheerful countrysides. Still, Christie's incredibly intricate plots could send you reeling for days. 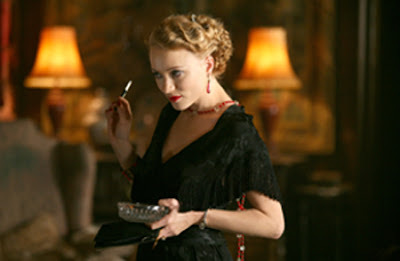 Granted, yes, with that many red herrings and a few sort of obvious clues as well as characters to introduce that people ended up being more or less types rather than psychologically three dimensional people (which was her biggest criticism as referenced in Super Sleuths)-- for Poirot especially, it was less about the crime or even the supporting players and more about those amazing denouements. 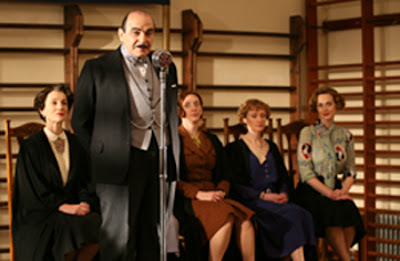 Moreover, they were so endlessly complicated that it's a wonder that poor David Suchet didn't pass out during those challenging tongue twisting monologues that may as well have been soliloquies for all the involvement they required from the rest of the cast-mates. And while cinematically, you're committing screenplay suicide when the writers realize they have to work in Poirot explaining how something went down for--I checked my watch in one case to discover that we had a twenty-five minute denouement-- the brilliance of the Masterpiece Mysteries movie collection of the Poirot cases as opposed to the original television hour long series of Christie short works is that the editors are able to go in and help us along by showing earlier scenes, inserting new points-of-view to explain the motive and/or killer etc. This is especially beneficial for this viewer since-- despite my first acting gig being in the musical Little Miss Christie about the author and being able to perform two solos-- I've always been more of a Miss Marple fan since Poirot's character is so peculiar and his cases are often beyond comprehension at times that even when I reread the ending or watch the conclusion again, I still feel like I'm missing something which is exactly what happened with the first film in the box set of Mrs. McGinty's Dead. 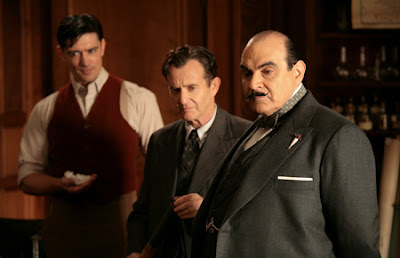 Par for the course of the superb production values and ensuring that the films all blend together nicely so that-- as Suchet noted-- he will have left the complete works of Poirot on film for future generations to cherish when they film his final case very soon, McGinty is gorgeously crafted and boasts a solid opening hook. Namely, a handsome and poor young man has been convicted to death for the murder of his elderly landlady and-- although the case itself was sound-- even the prosecutor doesn't feel like he's sent the right man to the gallows. Asking a favor of his old friend Poirot to head off to the countryside and journey to the area where the man resided-- soon our hero discovers that there's far more secrets lurking in the village than he ever would've imagined. Of course, fortunately he finds there are pleasant surprises to be had as well when his friend Ariadne Oliver arrives out of the blue to help add some much needed humor to the mystery-- aside from once again laughing with our "Belgian fish out of water" lead who is-- as played by Suchet fond of misplacing verbs in his sentences and doesn't exactly blend in with the locals. Although there's a few predictable twists along the way not to mention one great wicked usage of Poirot's wit when the fact that someone tries to push him in front of a train not only thrills the sleuth but makes him realize that the wrong bloke is behind bars-- somehow the third act of the ninety-three minute film feels a bit too rushed. Eventually it finishes in a confusing manner and never manages to grab us in the same way that its superior counterpart-- Cat Among the Pigeons does within the very first act, only growing stronger as it continues. Basically, all it takes is the sight of Poirot trying to give an introductory speech at a prestigious British upper class girl's boarding school for us to realize that mystery lovers' favorite wise Belgian who can solve a crime just by thinking is entirely out of his element. However, he's quick to realize that he's not the only male on campus-- as the young, handsome and overly friendly Adam Goodman who catches the eye of every young woman in both school and on staff-- immediately sticks out as well and when Poirot is asked by his friend, the headmistress to stay on for awhile and help her choose a successor from among the teachers in her employ, murder unexpectedly arrives at Meadowbank School. Interrupting his employment head-hunting search to find the person or people hunting heads when more crimes begin to hit the school-- Poirot soon realizes that nothing is what it seems at this boarding school where false identities, royalty, dirty secrets, voodoo dolls, blackmail, jealousy, and even espionage infiltrate the campus. 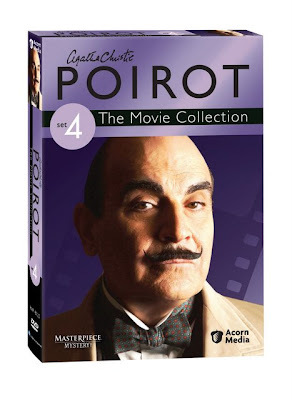 Thus, Agatha Christie's Poriot: The Movie Collection Set 4 manages to win us back from its rocky, standard opener with the seen-it-all-before Mrs. McGinty's Dead along with a fully up-to-date documentary that finds Suchet and others talking about their plans to film the final Poirot mystery and the history of the series by closing with this stellar title. Of course and true to Christie form, in Cat Among the Pigeons, the denouement is extraordinarily long and not altogether unexpected (at least in places) but this time in addition to providing us with some more entertaining supporting players than the previous film which had just aired on Masterpiece Mystery!, the title also has the benefit of at least keeping you in step with Poirot and the others throughout the final act. 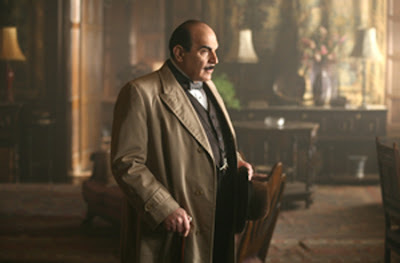 And as long as you don't have to attempt to adopt that unique accent or do the Poirot walk, any chance to try and think like Poirot-- and far more impressively-- solve a case like Poirot without lifting a finger, is a success in my book and I'd venture to say probably one in both Agatha Christie's and Ariadne Oliver's as well.